The following post briefly details how to demonstrate QoS on NetApp Clustered ONTAP 8.2. A cluster called cluster1 has been configured, along with a CIFS enabled Vserver with volume and share. The demonstration is run from a Windows Server 2012 Domain Controller in the lab. Download iometer from http://www.iometer.org and install. Change ‘Update Frequency’ to 4 seconds, and click the Green flag to start. 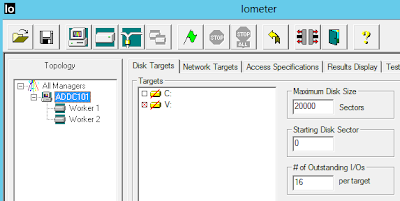 NOTE: Iometer creates at 80’000KB (20’000 x 4KB) file called iobw.tst in the V drive. NOTE: PuTTY output from this step is in the APPENDIX B. 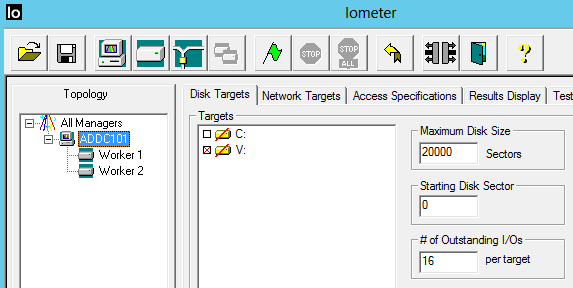 NOTE: The IOPS you see here should be close to what Iometer is showing. NOTE: The IOPS you see now should be close to the policy-group setting.